Welcome to the AbiliTees Website! Screenprinting, embroidery and promotional items for all your business and personal needs. 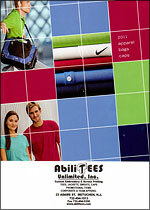 AbiliTees Unlimited, Inc., is a full service organization that offers a complete line of activewear for both screenprinting and embroidery, along with an extensive line of promotional items such as: tees, jackets, caps, sweats, fleece wear, uniforms for work and teams, mugs, key chains, magnets, pens, pencils, bumper stickers, balloons, totes, calendars, buttons... just to name a few. 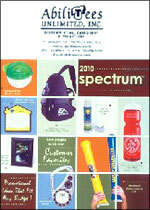 Our free, full color catalog is filled with 323 pages of exciting name brands. You can choose from Champion, Fruit of the Loom, Lee, Munsingwear, Jerzees, Gildan, Columbia, Hanes, Anvil, Red Eagle, Yupoong Caps, Toppers Bags, plus many others. Everyone says the world has changed. And everyone is right. We truly believe the world must be changed for the better. This year we are rededicating ourselves to the fundamental core values that have made our country great. Hard work. Vision. Quality products. These are values you have come to expect from our team and we pledge to carry this strong heritage forward. We are focusing our efforts so that doing business with us will be easier than ever. We offer quality work at reasonable rates and quick turnaround on most orders. When you need the best source for the finest imprintable sportswear items... we are your #1 choice. We know that our business will succeed only if you succeed. If your company has a need for custom embroidery or screenprinting with a professional touch, AbiliTees is the answer to all your needs. Our in-house art department and state-of-the-art computer technology allow us to replicate or design any logo. As your business partners, we are committed to working closely with you to provide the support you may need. You can always count on us to provide the finest product selection and professional advice.